Mario really doesn't need to be present; Nintendo probably thought he'd sell a few copies though. Nintendo’s two Picross games for the Nintendo DS (Picross DS and Picross 3D) easily top the list of great timewasters. In them, players use logic and a hint of math to fill in empty grids that then yield an image. They can take anywhere from a few seconds to a half hour depending on the size of the grid, and each game contains hundreds of puzzles. The ease of playing them and the sense of accomplishment fuels their drive to consume any of my free time. 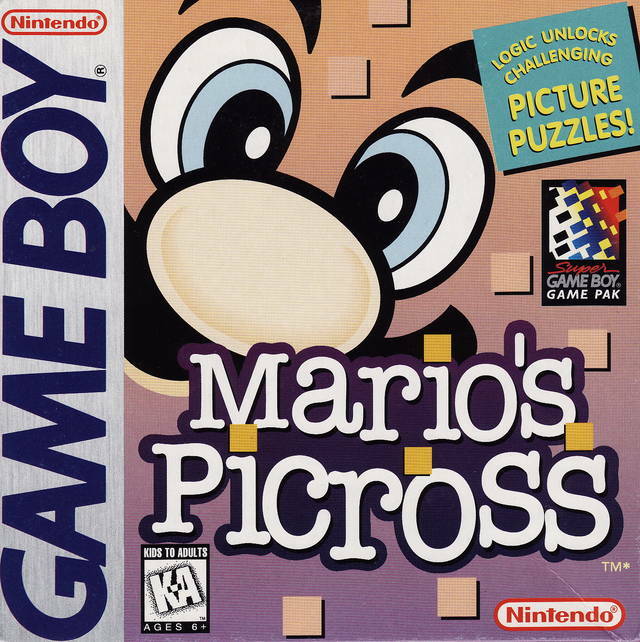 Mario’s Picross was the original Picross game from Nintendo and it was released on the Game Boy in 1995. It’s also available as a downloadable on the Nintendo 3DS via its Virtual Console storefront. I recently picked it up, and as is always the case when I play one, it consumed my time and had me staying up late saying to myself “just one more” over and over. Picross puzzles are grids of blank squares that need to be filled in. Beside each row and column are numbers designating how many squares are to be filled, and in what order. For example, imagine a 15 x 15 puzzle with a row that has the numbers 7 and 7 beside it. Because the row is 15 squares long, I know that the first 7 squares are going to get filled in, there’ll be a space, and the last 7 squares will be filled in. That’s an easy example because the numbers indicating how many squares to fill in total 15; 7+1 (blank space)+7=15. It gets trickier when a row or column has only a few filled in squares. In situations like that, players really have to examine other rows and columns and view puzzles in their entirety. Notice the Egyptian-like pictures; it's as though Mario was an archaeologist. In the Nintendo DS games, when I’d fill in squares, their corresponding numbers beside the row or column would become grayed out, making it easier for me to keep track of what I hadn’t done yet. This feature isn’t present in Mario’s Picross and it made solving puzzles not necessarily tougher, just a little more annoying. Another facet that hinders my play sessions is the size of the screen. If you don’t remember, the screen on the original Game Boy was tiny; it’s probably the reason I wear glasses today. I tended not to play Mario’s Picross for extended sessions to avoid eye strain. The screen is enlarged on the 3DS, I just wish you could distort the perspective to make it fit the handheld’s screen entirely. Still, Mario’s Picross is a great timewaster and a great game for just a couple of bucks. I thought I’d change the format of these weekly posts up. Instead of rambling on mentioning what games I played in the previous week, I think I’m going to discuss my highlights from the previous week in regards to anything and what I’m looking forward to in the next week. So my highlight from the previous week was the advent of springtime weather and the ability to begin playing tennis, disc golf, and more outside activities regularly. My girlfriend and I don’t get to spend a ton of time together but we’re always together on Thursdays. Conveniently enough, in Oklahoma last Thursday the temperature nearly reached eighty degrees Fahrenheit and I took the opportunity to coax her into an hour of tennis. One more brief highlight from last week before moving on. I’m a huge fan of Picross DS and Picross 3D and last week I finally took the plunge and downloaded the GameBoy game Mario’s Picross for my 3DS. I’ve been playing that when I have the chance. Let’s see what am I looking forward to this week? I know, the release of Mass Effect 3! I’m excited to play Commander Shepherd’s finale and am really looking forward to seeing how it wraps up. Before picking up Picross DS, I had only heard of picross through snippets in magazines and until I played it I had no idea why it received these mentions, when there had only been one game released in the US. Once I had got it, I was instantly hooked. I’m a fan of Sudoku and crosswords and for those who have never played picross, it compares to those games favorably to those kinds of games. Notice the blue squares that have been marked in and the faded clues on them. 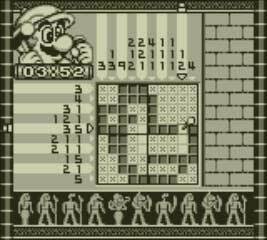 Before making the transition to 3D, picross was played in a grid (5×5, 10×10 etc.) and to complete it you’d fill in boxes by the clues given to you on the outside of the rows and columns; once completed, an image is revealed. I would have been happy with more puzzles for picross but instead they went and added another dimension which changes the game dramatically, yet it still retains familiar elements that make it picross. In Picross 3D you are now given a 3D grid, that you can rotate and “look into” to figure out the image. Each image is completed the same as it has been in the past: each row and column still has the numbers that tell you how many of those boxes you need to fill in. The controls are superb and allow you to maneuver the starting grid easily and without any confusion. The game has a great, and lengthy, tutorial explaining every aspect of the game clearly and repeatedly which will help new players learn invaluable techniques and practice using logic to complete examples puzzles. Creating a school bus with the creation tools. There are more than 350 puzzles, and if my experience with the game is any indication, it’ll keep anyone busy for a long time. Whenever I play, I typically do a handful at a time or pop in some music when playing for extended periods; I seem to play it every night just before bed. Once you finish with the included puzzles, you can get online to download more, for free, for what looks like will be a long time to come. Even whenever I finish everything, I foresee myself going back and starting a new profile to do it all again, the game has a good ability to allow you that opportunity; once completed, I can come back to a puzzle and not remember how to quickly solve it, or remember the image until it’s revealed. And if you’re the type of person that likes creating in games, Picross 3D also scratches that itch. There is the ability to create your own puzzles and then share them locally or submit them for themed contests. Without a dedicated community to share with, I can’t see the creation being that much of a draw, unless you have a friend or two who are into that aspect of games. For only $20 it’s hard not to recommend, and with the amount of puzzles included, it’ll remain in your DS for a long time, but if you’re not a fan of games like Sudoku or crosswords, check it out before running to the store, regardless I highly recommend getting Picross 3D.